Norway’s most acclaimed pastry chef, Sverre Sætre, brings his latest tempting dessert discoveries to the table with recipes for everything from decadent cakes, tarts, and puddings to candied fruits, chocolate confections, and cookies. 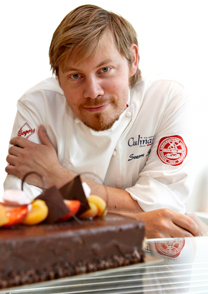 Sætre’s desserts are anchored in Norwegian tradition, such as Fyrstekake (layers of rich butter pastry with a marzipan filling), Kokosboller (chocolate-coconut truffles), and Tilslørte bondepiker (sweet fruit compote with whipped cream), but his creative twists make each sweet dish original. See also: Fancy High Heel Shoes for Dessert? I think sweet cherries and almonds are wonderful flavors that complement each other perfectly. Since the early 1800’s, Norwegians have made almond cakes. 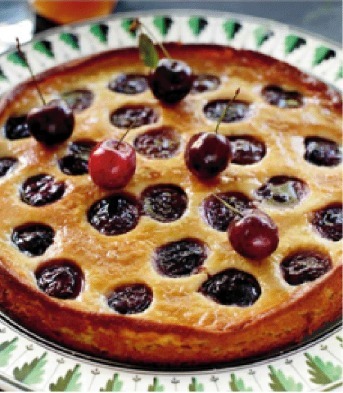 Mazarin cake is a classic, and I have used this as a basis to create this succulent and good fruit cake made with vanilla cream and cherries. Of course, you can use all kinds of fruits and berries, but if it’s sweet cherry season, you should definitely use them. I prefer sweet cherries from Lærdal, which is famous for its exceptional sweet cherries. The climate and the valley floor provide unusually good growing conditions, and berry experts from all over Europe come to study this area. Sætre has published the book Norwegian Cakes and Cookies, which is available on Amazon. Mix 0.8 cups whole milk, 0.3 cups heavy cream, and sugar in a pan (The pan should be half-full). Heat it to the boiling point. Mix the rest of the milk and 0.7 oz cornstarch in a bowl and whisk it lightly together. Whisk in the egg yolks into the milk and cornstarch mix. Pour 2/3 of the hot mixture into the egg mixture gradually while stirring with a whisk. Add the vanilla pod. Pour the mixture back into the pan. Bring the mixture to a boil and let it simmer for 1/2 minutes while constantly stirring at the bottom of the pan with a whisk, so that the cream does not burn. Remove the vanilla pod after the cream has boiled. Pour the cream into a bowl and refrigerate. Preheat oven to 356 F (180 ° C). Add the cold vanilla cream in a food processor with almonds, cornstarch, eggs, softened butter and powdered sugar, and run it so that the almonds are finely chopped. Place the mass in about 0.4 inch (1 cm) thick layer in a greased roasting pan. Cut the cherries in half and remove the stones. Spread the berries on top of the cake. Bake until golden, about 25 minutes. Let the cake cool completely before removing from the pan. Goes very well with whipped cream.